Summer may be coming to an end in many parts of the country, but health conscious moms are always looking for ways to keep their children safe from harmful chemicals and harmful bugs throughout the year. Recently, we were sent Absolute Green Kids Natural Bug Repellant for review and I am so happy with the results. As you all know, I'm all about limiting my family's exposure to toxic and harmful chemicals. With the rates that chemicals are disrupting our endocrine system and creating neurological side effects, I just cannot, in good conscience, expose my daughter to chemically laden products. But I've always said that when it comes to bugs, I tend to whip out the serious stuff. Bottom line? Bugs carry some nasty stuff. And though I would have never believed it before we lived in Arizona, the number of mosquitoes here is crazy! When my family goes out to our backyard to play on her little playground, we come in with SO many mosquito bites, it's just INSANE. We had to start looking for a safe bug repellant, because she is mildly allergic and welts up the size of a quarter and they're hard for more than a week! However, once I began researching the ingredients in many of our typical summertime products, I had to seek out a way to be able to keep her safe from exposure to nasty chemicals, while still keeping her safe from environmental factors. DEET is an extremely toxic chemical that goes into your bloodstream? DEET runs throughout your nervous system (brain and spinal cord! ), and has been proven that it causes neurological damage? That the Environmental Protection Agency (EPA) recommends that you wash DEET off of your skin immediately after returning indoors? I knew it was bad, but I didn't know the EPA actually had a formal position on DEET. They recommend only SHORT TERM usage of DEET and that long term exposure of more than 2-3 hours is not recommended. DEET has been found to cause fatalities in children and physicians advise you not to use it on children! This is why there are such low quantities in "children's" bug repellants. You are not to spray DEET near the face, should not apply on hands or faces of children, and that you should not spray DEET underneath any clothing (even looser items like shorts or t-shirts)- spray on exposed areas only. DEET products should not be used simultaneously with sunscreen since DEET has been shown to reduce the effectiveness of both products when used together. So, what exactly are we supposed to do, considering OUTSIDE is where we need sunscreen? It takes MULTIPLE washes to get DEET residue from your clothing? DEET DOES NOT dissolve in water and is TOXIC to fish, such as rainbow trout and tilapia, and other wildlife. 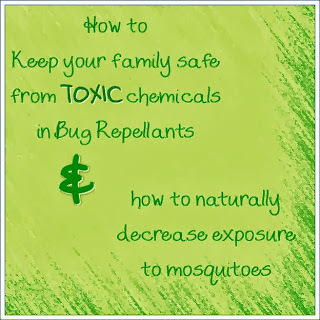 DEET chemical alternatives are a repellant called Picaridin and Permethrin. Permethrin KILLS mosquitoes and other bugs, and is used in animal tick and flea treatments- it is NOT to be directly applied to skin and should ONLY be applied to your gear. Permethrin is known to not "rapidly" harm mammals or birds, but is DANGEROUSLY toxic to cats and fish. This is just SOME of the information out there on DEET and other chemical alternatives to Bug Repellant Sprays... There is no way that I am going to allow ANY of that to get close to my daughter!! Knowing this information, I began the quest to find a DEET-free Bug Spray that would be safe for Nugget but also protect her from those nasty, infection carrying mosquitoes. When I came across Absolute Green Products, I had to try it. ABSOLUTE GREEN was founded;as the result of an asthma/allergic attack. A home improvement [project] caused Karen Halo to have an asthma attack. Vowing this should happen to no one else, she started refiguring some natural formulas starting in college. She wanted products that worked well and smelled great, but without chemicals or artificial fragrances! Using only 100% natural ingredients and essential oils, she's created safe and all natural solutions for you, your family, your pets and the earth! Halo has taken the guessing out of "what cleans what" and eliminated the danger of using multiple toxic products, that could create adverse chemical reactions when mixed together. Get rid of those harsh cleaners under your sink and replace it with our safe and effective products. No Colorants or Dyes, No Chemical Preservatives, No Synthetic Fragrances, No Sulfates (SLS, SLES, ALS) and No Phosphates are ever used in our products! Our products are Cruelty Free, Vegan and Gluten Free. Our bottles are BPA #1 which has no BPA to contaminate the product. Our products are NEVER tested on animals nor do we use animal by-products. The ingredients are definitely something I'm not afraid of putting on my daughter: Witch Hazel, ethyl alcohol, Neem Seed Oil, Lemon Eucalyptus Leaf Oil, Poly Sorbate 20, Cedarwood Oil, Clove Bud Oil, Bay Laurel Oil, Rosemary oil. 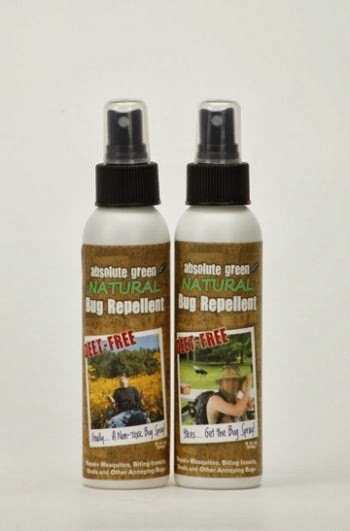 The Absolute Green Natural Bug Repellant is effective, and keeps the bugs away for hours in between applications. It repels Mosquitoes, biting flies, gnats, no-see-ums and other annoying insects. The smell is SO much better than those toxic bug sprays I have used in the past and doesn't give me a headache. It has a rosemary-ish scent with a hint of cloves, and mild notes of Neem. What really made this spray an absolute winner is the fact that I can liberally apply it to Nugget without worrying about harming her with chemicals. You don't even have to strip and scrub down following the use of this spray: another win for the no additional laundry! A few tips on decreasing your risk of being pestered by bugs? Staying indoors starting at dusk and waiting until the sun rises. Dusk tends to be the peak time that mosquitoes come out in our yard. Make sure you apply your Absolute Green Natural Bug Repellant before going outside. I will definitely be purchasing more of the Absolute Green Natural Bug Spray and keeping it handy to use when needed. They even carry various home cleaners and safe air fresheners. A review on a cleaner will be coming soon! Limited to US only, 18+. Winner will be notified via email and has 48 hours to respond to notification or another winner will be selected. I would love to try the Lavender Linen and Fabric Freshener Spray. Mobile entries are not easy! I was entered for following @absolutegreen before I put my correct Twitter name. It's @mamandeeds. Thanks! I would love to try the Lavender Linen and Fabric Freshener- Natural. Fishermens Natural Bug Repellent & Soap Set! I would like to try the fisherman products. I would love to try the lavender linen and fabric spray. I'd like to try the Natural Peppermint air freshener.